First of all it is only first version- testing one. There are some pictures in the internet and some how-too’s. But there is no building plans for real digi-legs. BTW, digilegs is some brand product. But who cares about brandnames. This is quite interesting assignment to finish these legs. And everything is more complicated, especially if you try to build these stilts for heavy adult. Heavy, this means normal man, not oversized fat burger. Also, the stils must be proportianally big, not just something to run on your toes. So, starting numbers: human weight- 85kg (187 pounds), height 195cm (6 feet 449⁄64 inches). Legs will add up to 40…50cm to overall height. Everything looks nice, but there is system of levers here. So load on some joints is extreme. First test show, that if you use cheap and thin steel and weak steel cables you can hurt yourself. My first version was damaged after first try- lower part bent. After few steps steel cables broke. Lower parts- steel square tube, “hoof” with real horse shoe. Upper size alluminium and some fiberglass. The DVD/CD is for size. The upper side is not solid aluminium, but smaller square aluminium tubing glued to some aluminium plate and extra riveted. This give light weight and extra strong construction. I call it composite material. This is security-safety steel cable on knee joint. This, thin (~2mm) cable prevents reverse knee joint movement. Main (power) cable is much thicker. 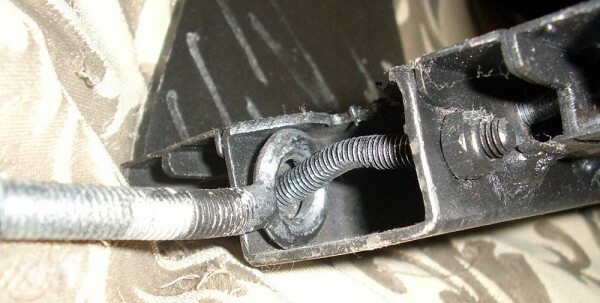 Fixing point in the aluminium-fiberglass composite is reinforced with extra layer of aluminium and some blind rivets. When jumping I listened to the sound of breaking steel but aluminium was intact. Knee and foot joints are made with ball bearings, “toe” joint is simple. Simple bolt-hole-nut solution will brake after hundred of steps. Here is another safety feature. The “hoof” (the real horse shoe) can move a bit to keep your side-to-side ballance of flat surface, but ballance front-rear is kept only by legs “stepping” (just make another step to keep you standing). To keep body from bending to much in to the front, hoof movement is a bit restricted by cables. When body is going to front, the cable strightenes and now you move with hoof, not the hoof hinge. 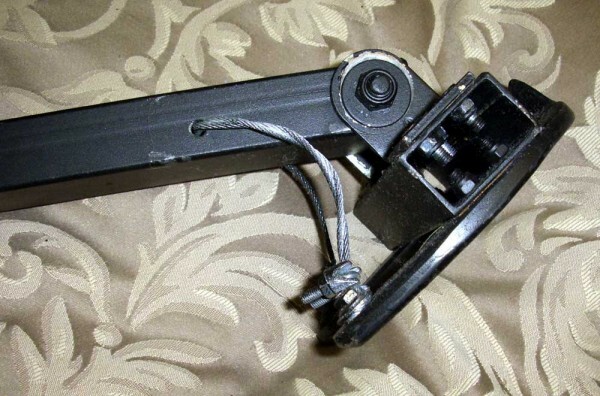 This adds extra length to lever and keeps the body in more stable situation. As this lever is very small, the effect is hardly noticible (maybe I need to move centre a bit to the back), but when walking, it ads extra stability. Extra nuts and washers keep Achilles joint in the centre. There is newly made “V-groove” in metal tubing. During experiments there was only thin gap exactly the size of the joint. But when I was walking it sometimes stuck and the wall of bigger steel tube was deformed. Other side is without extra nuts. 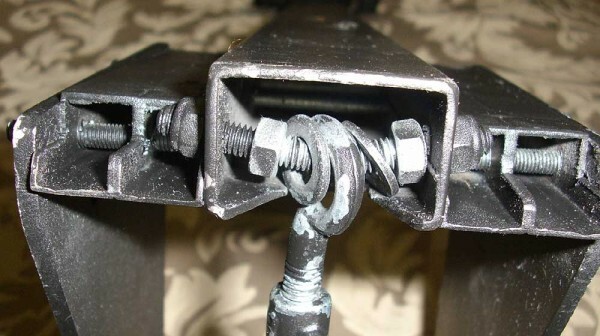 Here you can see the deformation to the bolt there is no thread left and steel cable regulation bolt is bent. Damn forces are here! 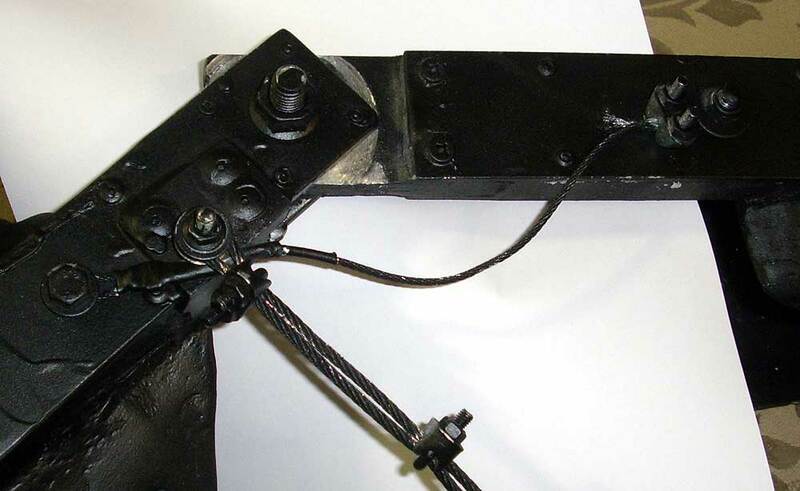 The upper side of Achilles cable have problems too, but it is not clearly visible in the pictures. So I do not show it here. BTW, when I was at full height with these stills, I was very affraid… It looks that you are very tall man and when you’ll fell down, all your bones will crack. It is possible to walk agile in last versions. If you have enough strenght… and you are not afraid of sore legs and bloody blisters. As this is extra lenght, it give you extra speed on the price of extra power from your muscle. Initial design was too long on “feet”.